The Teien Art Museum, Tokyo’s Art Deco palace, makes a home for the enduring decorative arts. 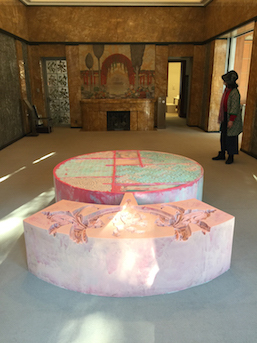 A couple years ago, the amazing Alice Gordenker gave a tour of the Tokyo Metropolitan Teien Art Museum, explaining the history and the Art Deco design of the house. When it was constructed, this building was the leading edge of design. Touring the Teien, one can’t help imagining the house as functioning residence filled with the furniture, clothing, dishes and sundries. The exhibition “Decoration Never Dies, Anyway” fulfils this longing. Many of the rooms display the art as if the museum were still in use as a residence. It’s as if design continued to be a living part of this building and we get to see how the house would continue its design tradition today. To that end, pieces such as the literally titled A Pile of Miniature Books (2013) by Akiko and Masako Takada appear as variations on items found in living spaces like the library, dining room, and bedroom. Each piece reflects the tone, colour or artistry of its room. The best example is Nynke Koster’s silicone Oranda no Kakehashi (The Bridge to the Netherlands) (2017) in the main house. The relief pattern of the mould echoes that of the wall. 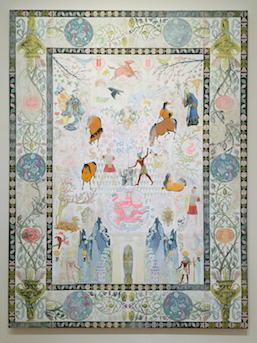 Pairing Kour Pour’s acrylic paintings of carpets with Akiko and Masako Takada’s embroidered miniature rug Trump Cards in the same room is also a nice comparison of scale. A home often has elements that one minute are hard to find, and once your find them, strikingly obvious. Wim Delvoye’s gothic filigree cut-metal Nautilus (2013) is in a room that is easy to overlook. Consult the programme often to make sure you don’t miss any of the art. One might walk by Akiko and Masako Takada’s Triumphal Arch (2014) several times before actually spotting it. When a home is full of people, you can easily turn a corner and be surprised to find someone there. 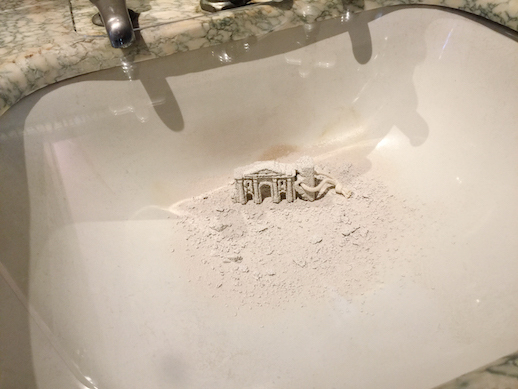 Several pieces by Yoshikazu Yamagata provide the same experience. Tucking pieces of art into unexpected places is part of the charm of the show. The search for works “hidden” in plain sight expands the idea of art and decoration being something we live with, not only pieces hung on gallery walls. Makiko Yamamoto’s ‘Through the Windows’ photo series doesn’t fulfill the same criteria as object or household item that other work in the show does, however. The idea of observation and communication are interesting, but seem shoehorned into this show. ‘Through the Windows’ would shine more in a different venue. Araya Rasdjarmrearnsook’s video series ‘Thai Medley I-III’ (2002) intrigues, but the connection to design isn’t apparent until you read the programme notes on how the video examines of the use of motifs for specific purposes. The work revolves around the theme of death, and as it shows the deceased, it may not be for all tastes. I found it to be done in a respectful and thoughtful manner. As if proving the show’s idea that “decoration could be described as being constantly in flux, in an endless cycle of transmigration” and that it’s not only for the gallery or museum, fashion designer Yoshikazu Yamagata’s dramatic red Inverness Coats from the 2018 After Wars Spring/Summer collection appeared in a shop window in Ikebukuro. It was nice to see the piece in a more mundane context and a lovely reminder that indeed, decoration never really dies, anyway. –You need a 100 yen coin for the locker. You get it back but best to have change handy. –Bring your wallet instead of leaving it in the locker so that you can have a lovely treat at the café. –Go early enough to admire the garden and light coming though the windows. –Receive 20% off admission with a MuPon discount!